Yeah Yeah Yeahs become the first band to film a video atop the Empire State Building with "Despair"
The Empire State Building has stood since 1931, the most famous piece of the New York skyline. 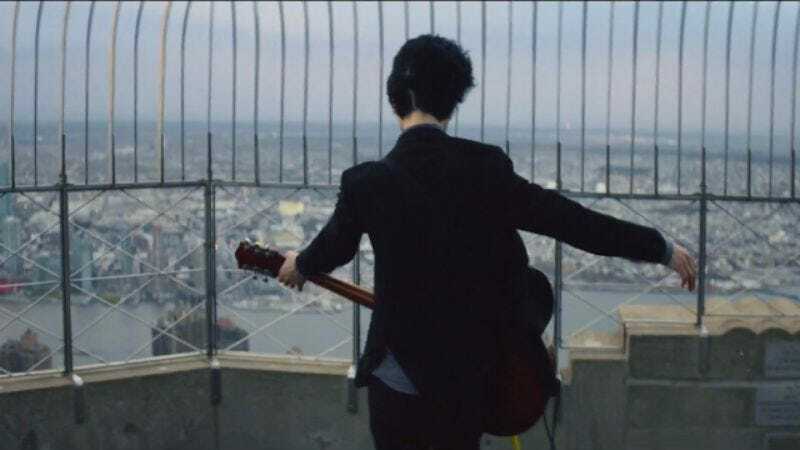 But in the building’s history, no band had ever filmed a music video on the observation deck—until Noisey pitched the idea to Yeah Yeah Yeahs for “Despair,” the latest single from Mosquito. Directed by Patrick Daughters—who also did the videos for “Maps” and “Gold Lion”—it starts with Karen O’s a cappella intro at the end of a dark night of copious drinking. The band wanders the city, eventually meeting atop the iconic 102-story building, the song slowly rising as the night dissipates around them. Karen O says about the clip: "It was my first-ever trip up to the top of the ESB, top of the world, we were up there from 3 a.m. to sunrise, I'm guessing very few get to see that view from up there at those hours.” The video manages to encapsulate the band's history into a new mission statement on growing older together—along with some indelible images. It's a perfect fit for a song about the light of companionship at the end of a dark time, and a band inextricably linked to New York City.